I squint at the menu in the low light of the restaurant at Hotel San Antonio el Real in Segovia in central Spain. When I read the description of Cochinillo Asado I know instantly what I’m having for dinner. 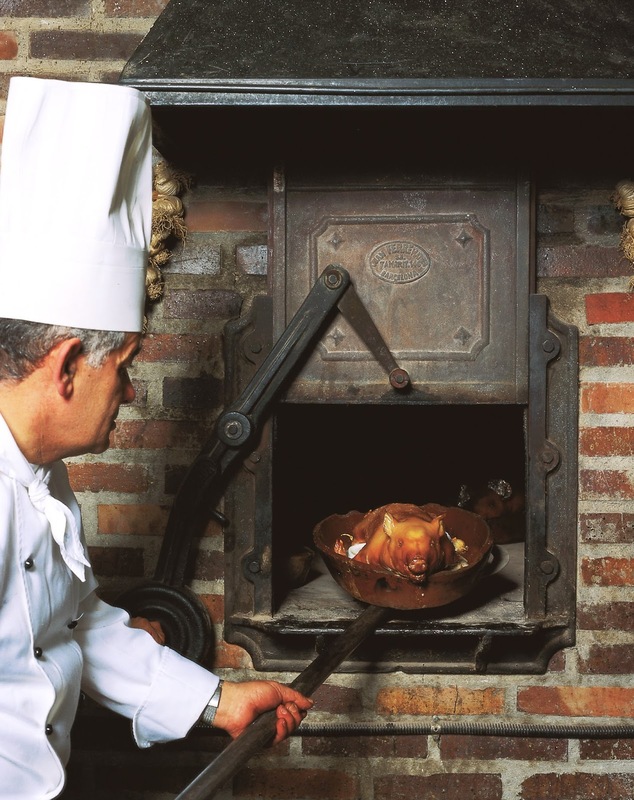 The whole roast suckling pig is a Segovian specialty and is cooked in a huge wood-fired oven. My plate arrives with a large piece of pork shoulder, with a golden brown, crispy and flavourful skin, and as I sink my fork the insides are soft and juicy. My next stop is Valencia, home of the famed paella. 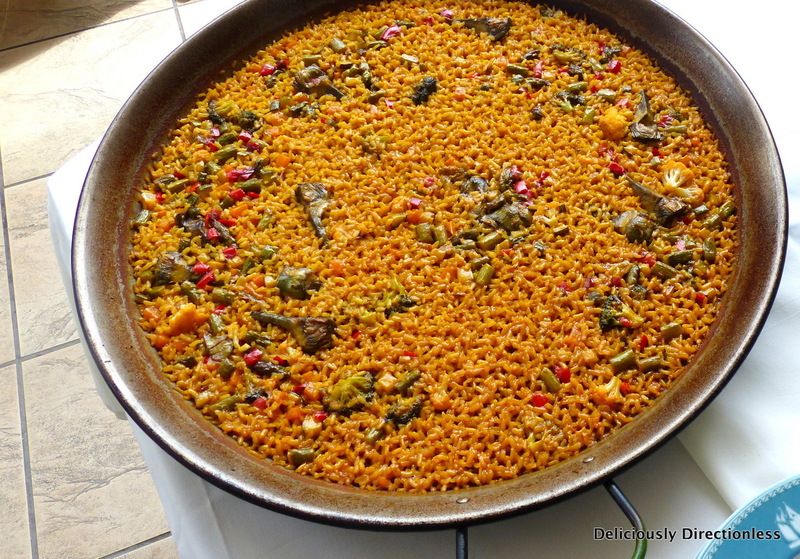 Non-Spaniards may consider paella as a national Spanish dish but it’s really a regional specialty from Valencia. And no other dish shows how great the Moorish influence has been on Spanish cuisine. The Moors were people of Berber and Arab descent from northwest Africa who reigned on the Iberian Peninsula from the 8th century till they were driven out in the late 15th century. They brought rice to Valencia, flavoured it with their favourite Arabic spice, saffron, and threw in wild game meat, especially rabbit and foraged snails. Even today, the traditional version of paella contains rabbit and chicken, and the more well-known seafood paella is merely a nod to the bounty of the long Spanish coastline. Paella, named after the wide, shallow pan in which it’s prepared, is usually cooked for Sunday lunch, and almost always by the men in the family. Further south in the pretty, whitewashed, flower-festooned Andalusian town of Córdoba, I get a taste of salmorejo, a variant of the more familiar gazpacho cold soup. 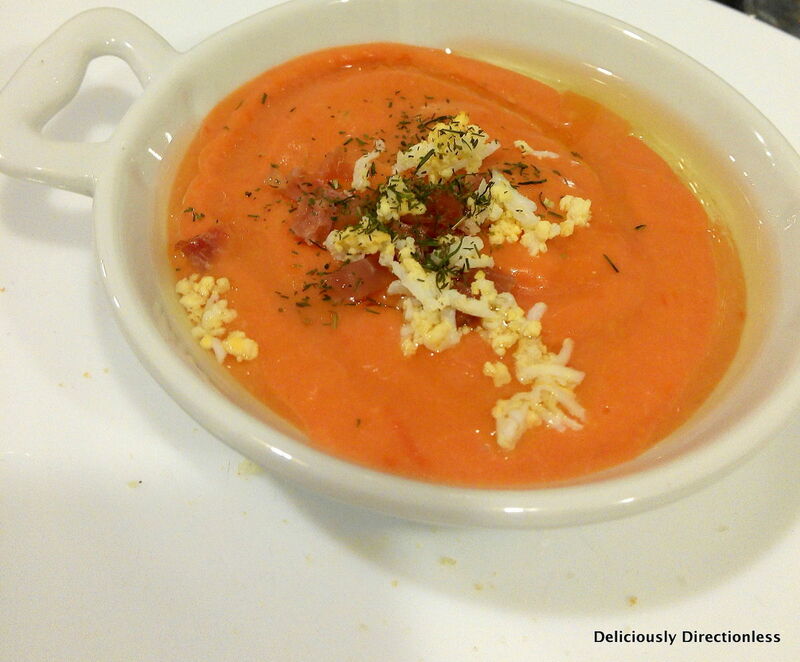 Unlike gazpacho (which also contains onions, bell peppers and other ingredients), salmorejo is a simple three-ingredient soup – just a cold puree of tomato, bread and garlic, with a bit of oil drizzled in. It’s thicker and creamier than gazpacho because of the bread, and minus the distractions of other ingredients you can actually taste the sweetness of the tomato cut by the sharp garlic. 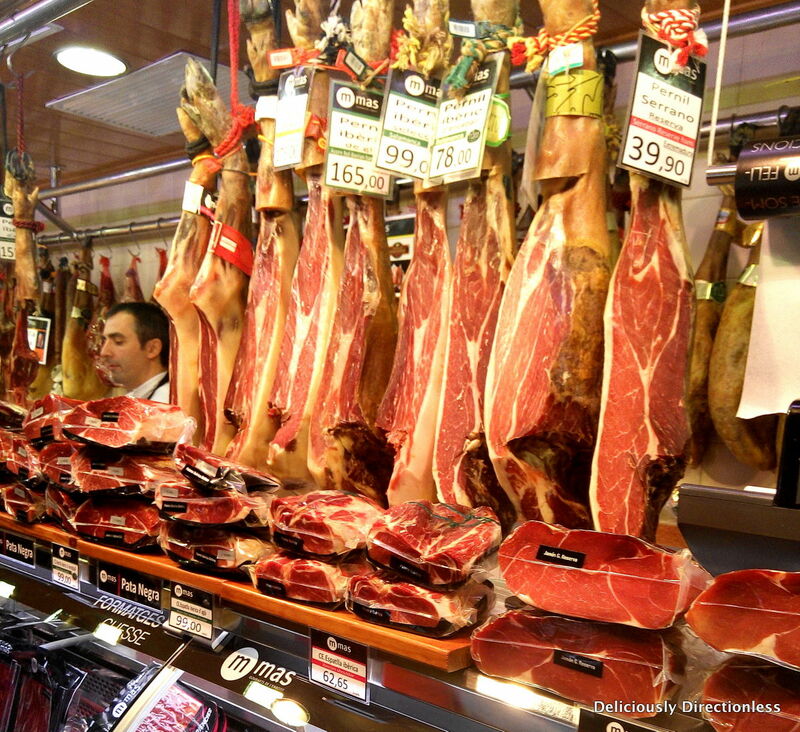 In an evening spent trawling the bars of Madrid, I get my first taste of Spain’s famed jamón ibérico on a food tour with Devour Spain. Taberna Real (Plaza de Isabel II, 8) is a small, family-run bar set in a place that was used by the Royal Palace for culinary tasks that couldn’t be performed inside the palace. 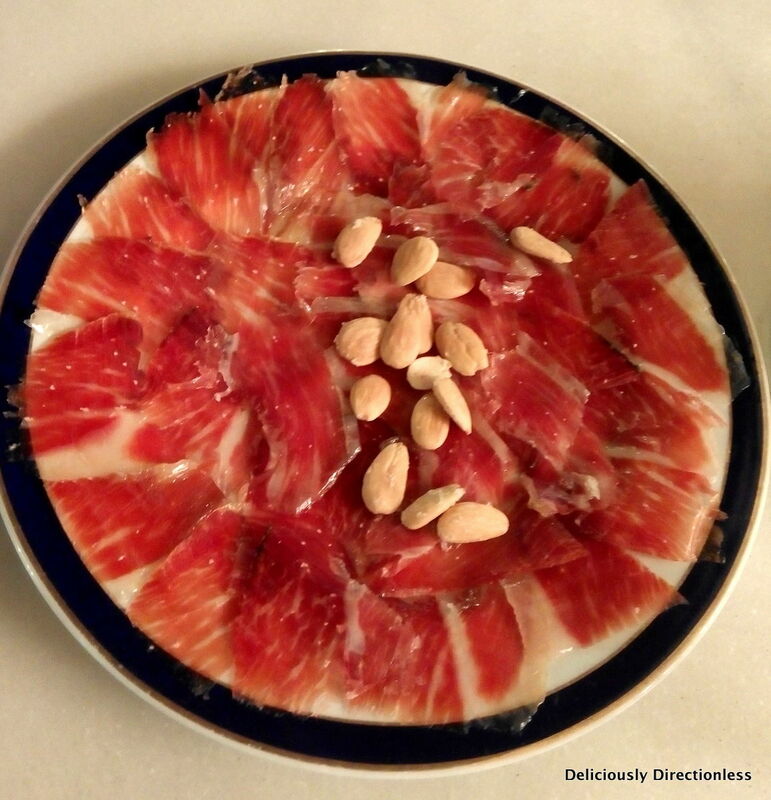 As I eat the thinly sliced, deep red, cured ham and take in its rich, savoury taste, my guide Luke tells me about jamón ibérico, which comes from the black Iberian pigs that are common to inland Spain. The pigs are fed barley and maize, and later allowed to roam free in the woods feeding on acorns, herbs and grass, which gives the ham its characteristic earthy, nutty taste. The ham is cured for at least one year, though sometimes the curing time could be as much as four years, and like wine, the longer the curing the better the taste. 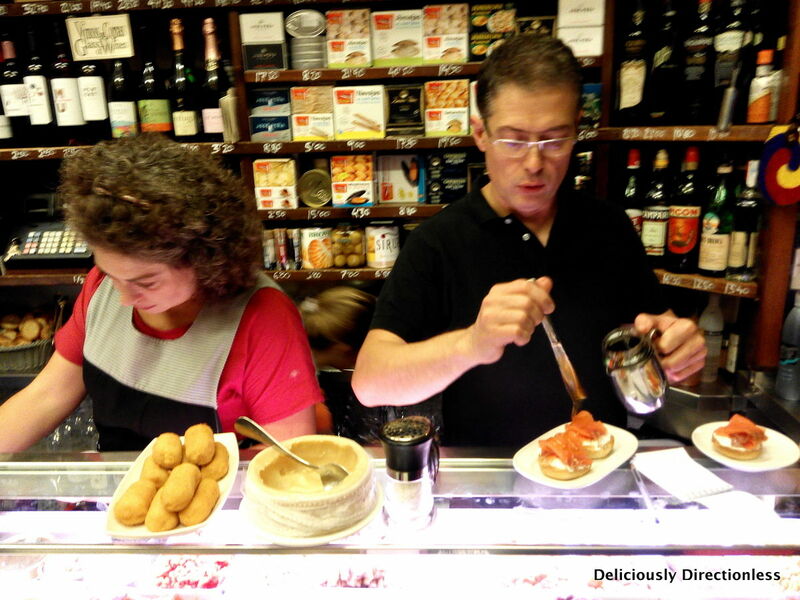 Another city, another food tour – again with Devour Spain, exploring the bustling, former Catalan village of Gràcia now a district of Barcelona. Gràcia still retains its community feel and is dotted with family-run eateries and shops. At Can Tosca (Torrent de l’Olla, 77) I’m initiated into the Spanish ritual of a second breakfast. It’s 10 a.m. and I’m a bit surprised to see that all the tables are occupied. 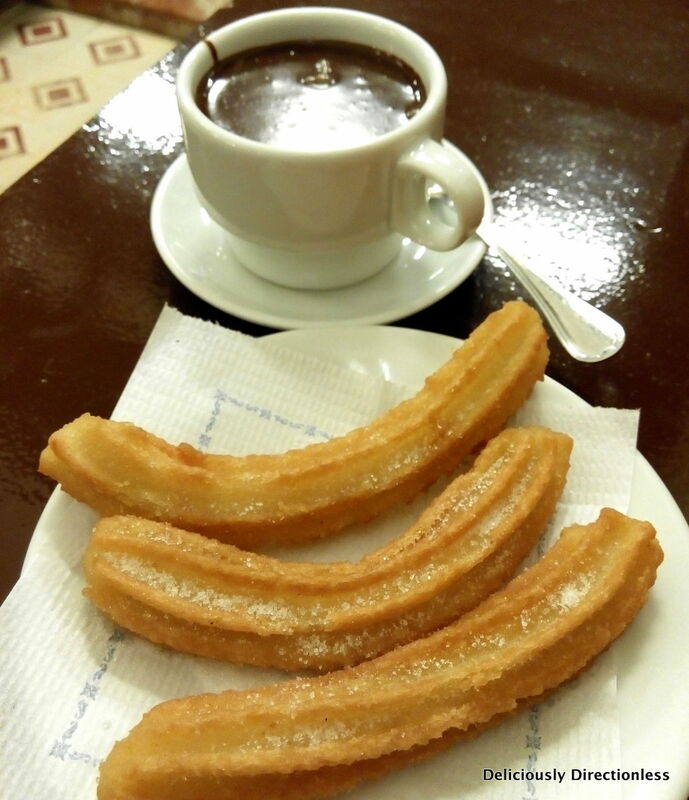 My guide Renee tells me that most Spaniards eat a light coffee-and-toast breakfast at home, and then meet friends or colleagues for la merienda – the second breakfast usually eaten at a local bar. I promptly get on board with it and order a grilled botifarra de perol sandwich, which is a typical Catalan pork sausage served in a bread roll of sorts. 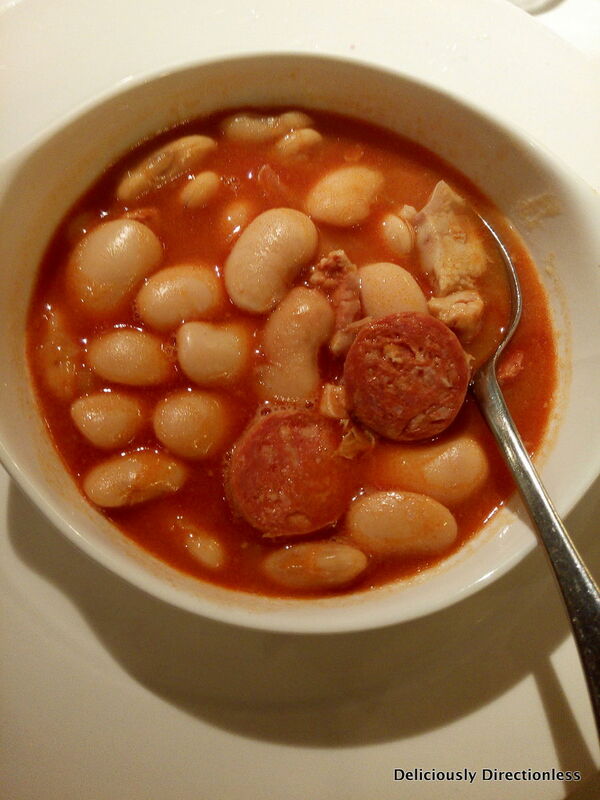 I wash this down with a glass of cava, the Spanish sparkling wine made from grapes grown in Catalonia. 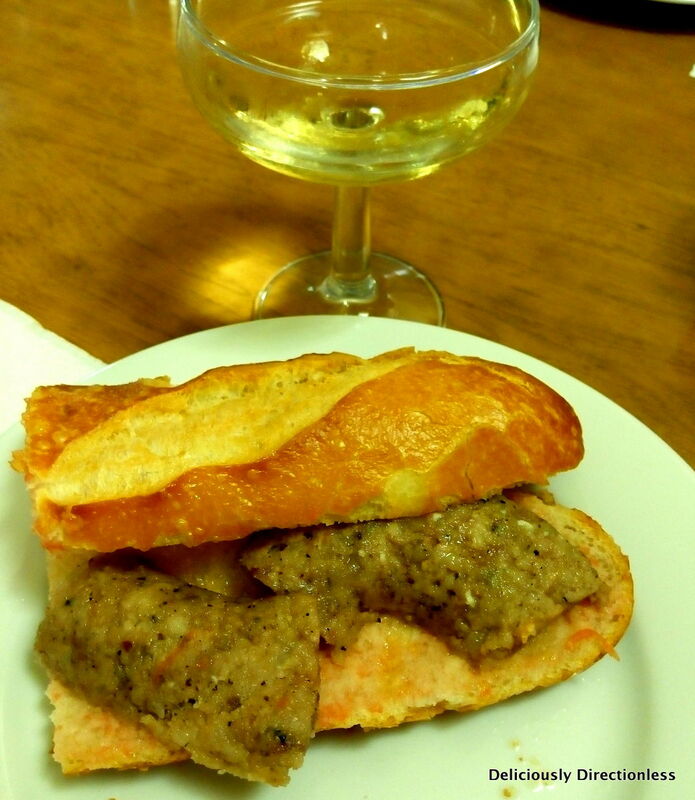 There are no pretensions attached to cava, unlike Champagne, and I have seen the Spaniards drink it at all times, including at breakfast! 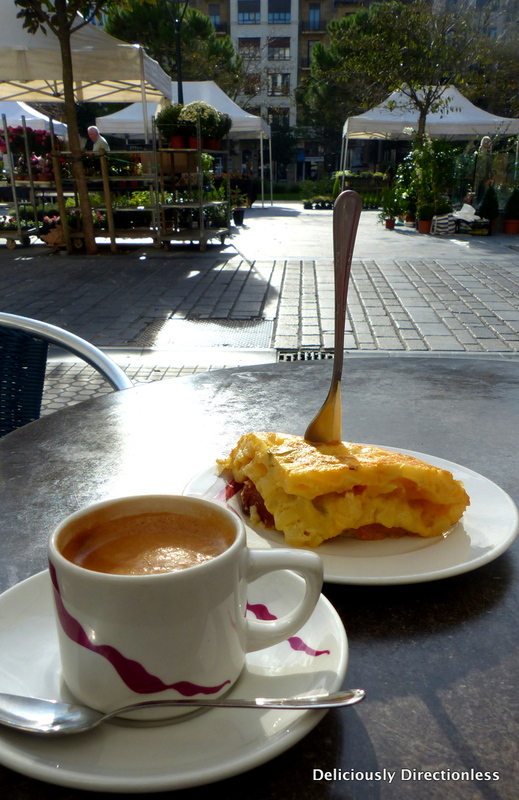 Another filling breakfast option for la merienda is the tortilla espanõla or the Spanish omelette, a thick, almost cake-like omelette made with eggs and potatoes. If you want to drink like a local, get a glass of vermouth, the fortified wine flavoured with herbs, spices, roots etc. 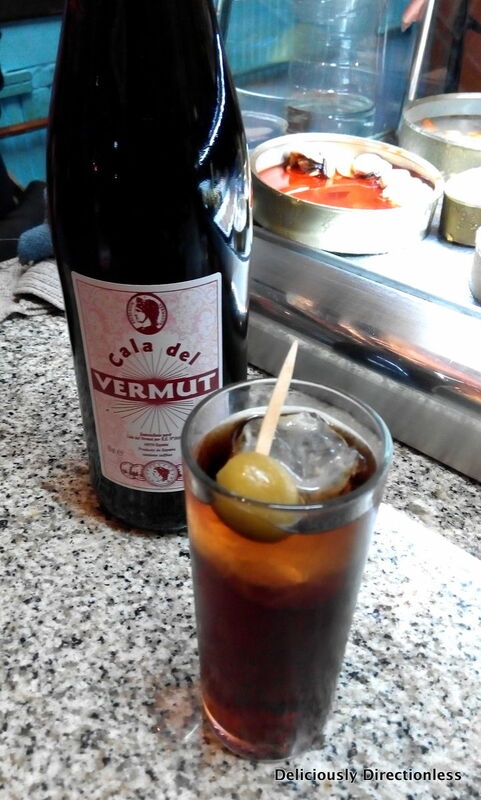 Every bar makes it differently, and at 1 p.m. or la hora del vermut (the vermouth hour) I find myself in Bodega C’al Pep (Carrer Verdi, 141) in Gràcia for a taste of the aperitif. The old-school bodega is packed with locals, including a large group of particularly argumentative senior citizens who are apparently regulars here. 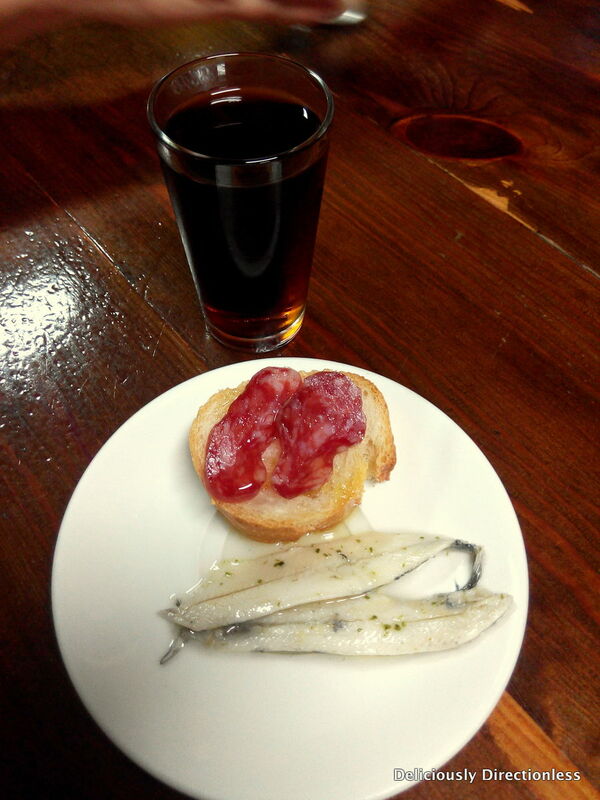 Rafa the owner brings us small shot glasses filled to the brim with the dark red drink; it’s sweet, spicy and a bit heady, and goes perfectly with the fuet (thin pork sausage cured in pork gut) and the pickled anchovies. After spending two weeks travelling around Spain, if you’d ask me for a foodie pick it would undoubtedly be San Sebastián. This coastal city in the northern Basque Country of Spain is a true gastronomic delight, boasting of Michelin star restaurants and humble bars – all of which serve some of the best cuisine in Spain. 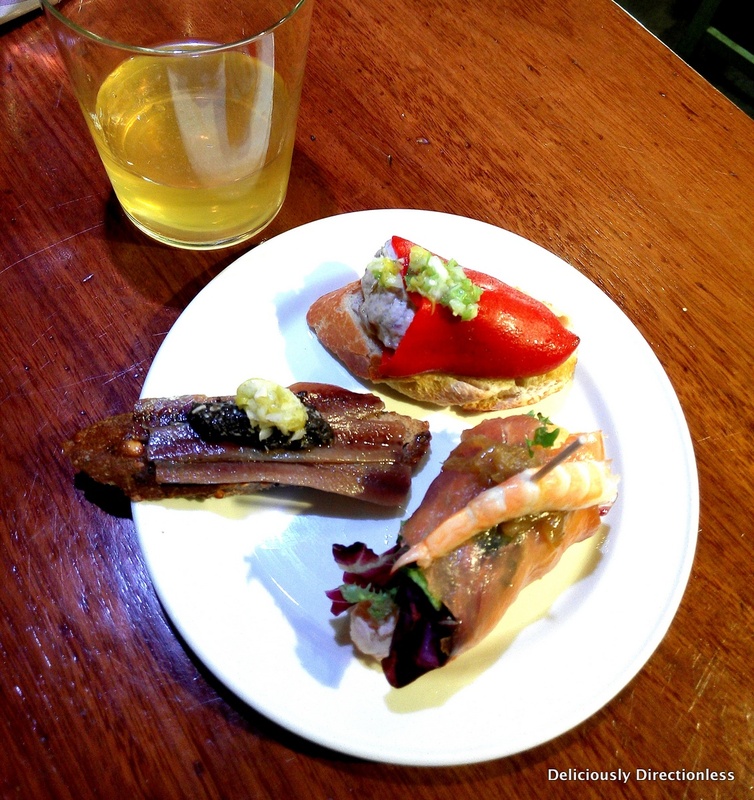 I spend my time pintxo-hopping in San Sebastián (yes, it’s a thing). 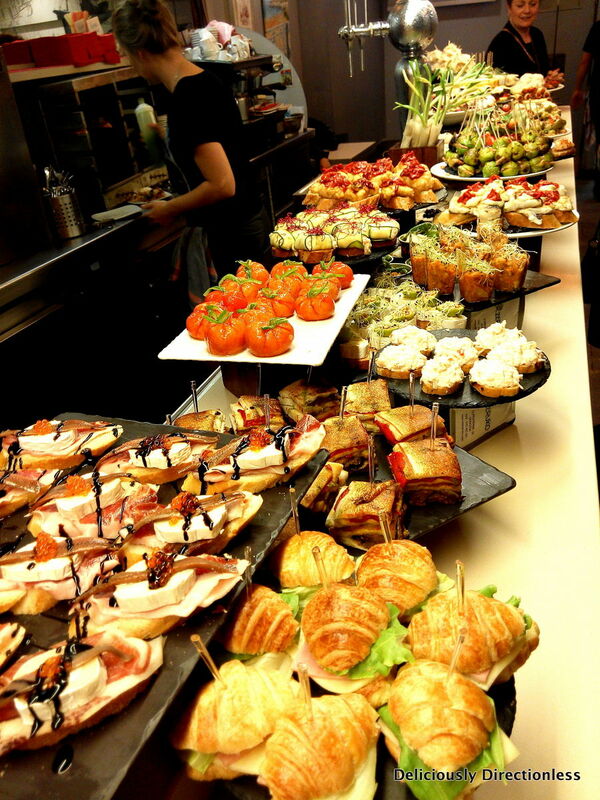 Pintxo (pronounced pin-cho) are the Basque variation of tapas, a small snack served on bread and usually skewered with a toothpick (hence the name pintxo, which literally means a thorn or spike). San Sebastián’s Parte Vieja or old town is a maze of cobbled alleys where I find myself at mealtimes, moving from bar to bar, taking my pick from a dazzling array of pintxos – anchovies, sardines, lobster rolls, stuffed sweet red peppers, croquettes and more, all washed down with local beer or young white wine called txakoli. 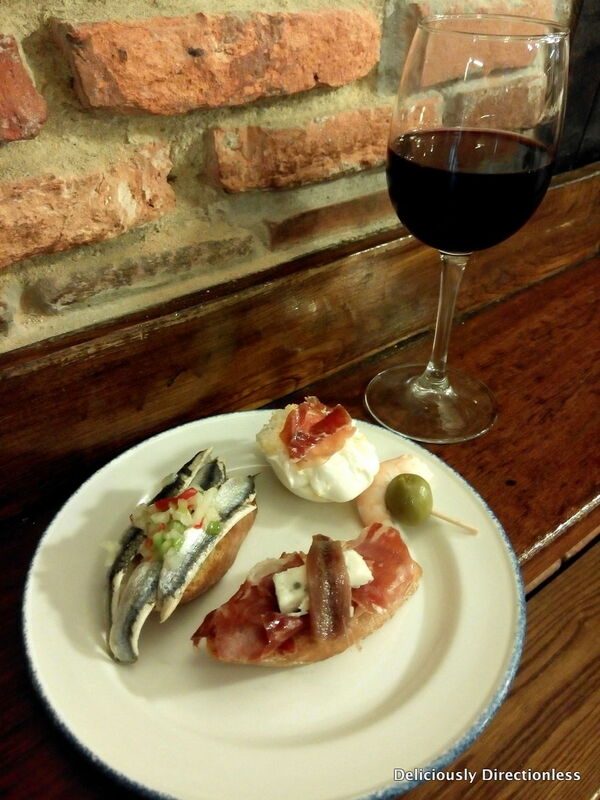 Quimet y Quimet (Carrer del Poeta Cabanyes, 25, Barcelona) – this standing-room only bar serves some of the best montaditos (small open sandwiches) in the city. 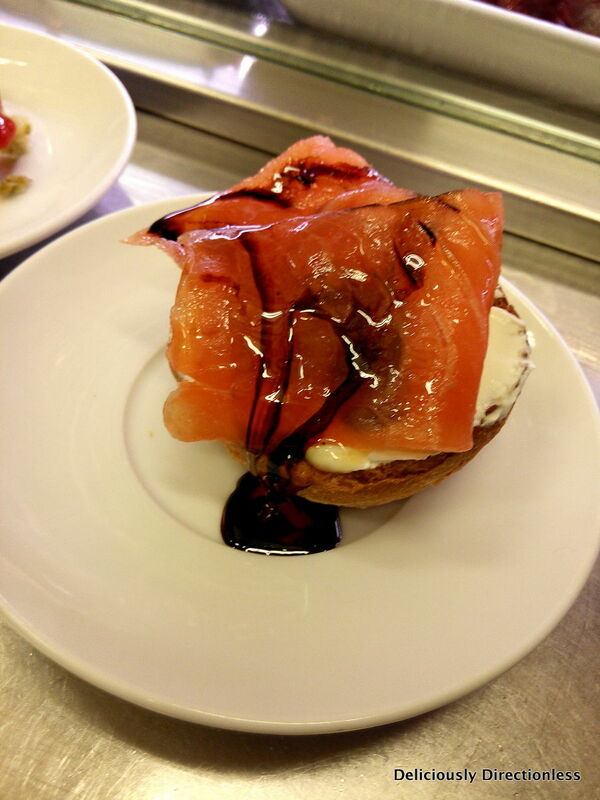 Try the salmon and Greek yoghurt topping, generously drizzled with truffle honey, or the sweet red pepper, Brie and artichoke topping. 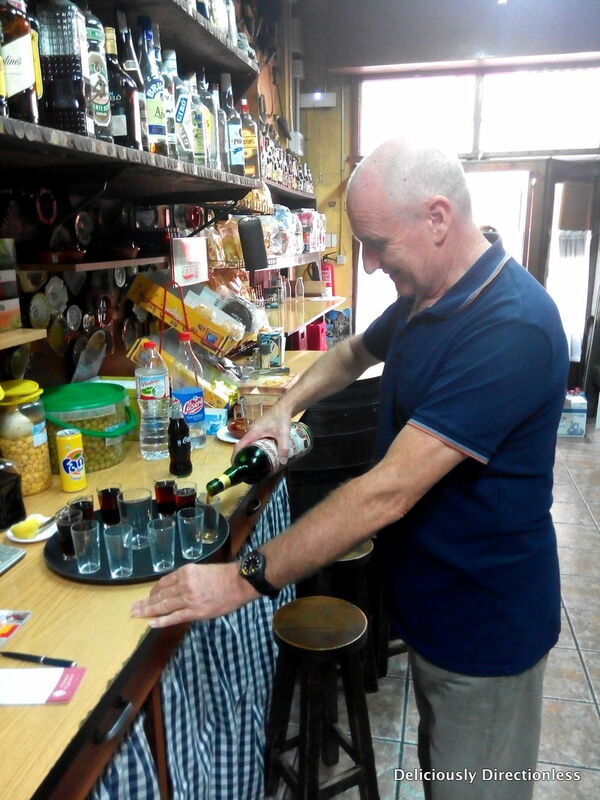 Bodega Cala del Vermut (Carrer de les Magdalenes, 6, Barcelona) – a tiny bar in the back alleys of the Gothic Quarter that serves its own brewed sweet and spicy vermouth on tap. 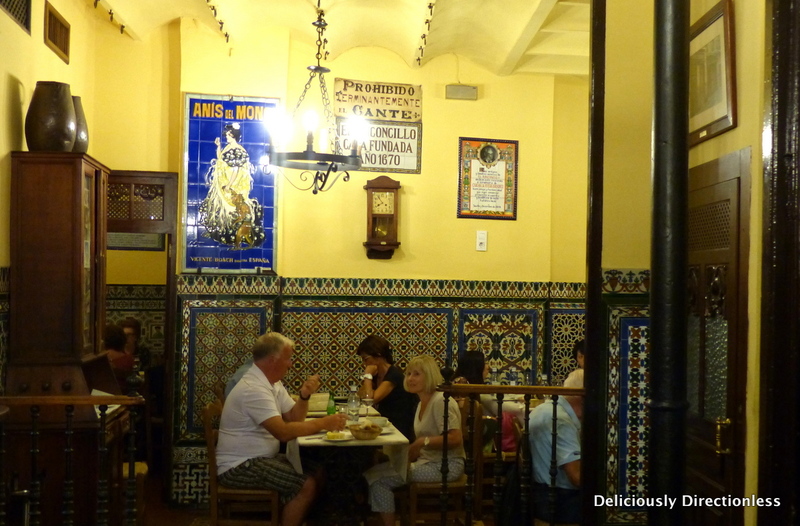 La Casa del Abuelo (Calle de la Victoria, 12, Madrid) – a lively bar serving fabulous gambas al ajillo (freshly fried garlic and chilli shrimp). El Rinconcillo (Calle Gerona, 40, Seville) – the oldest bar in Seville (dating back to 1670) for the sheer atmosphere and a glass of cold Cruzocampo Glacial beer. 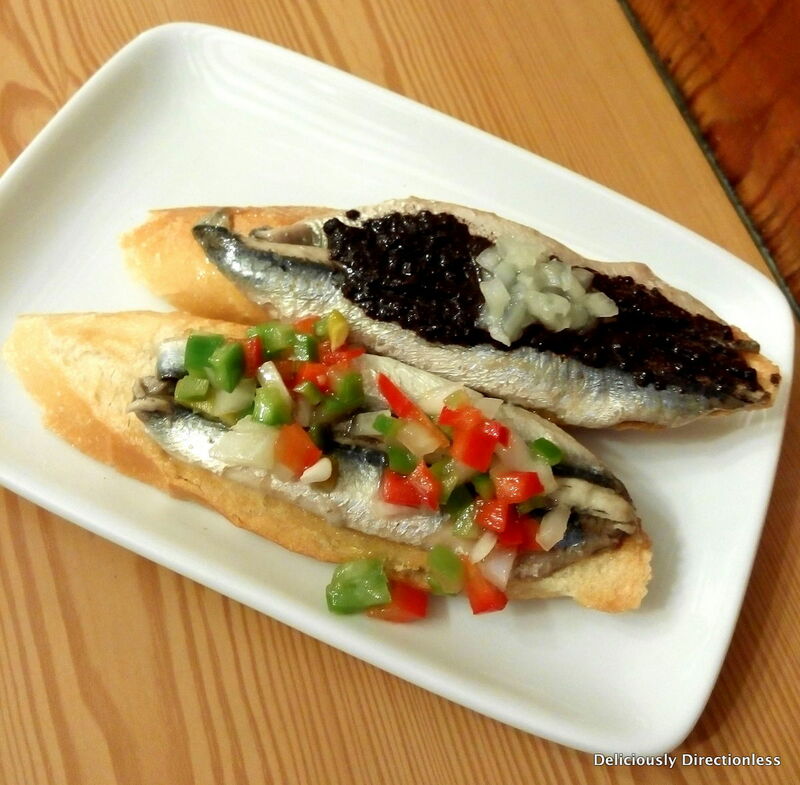 Bar Txepetxa (C/ Pescaderia, 5, San Sebastian) – for a taste of txakoli, the Basque dry, sparkling white wine, and a variety of anchovy pintxos. 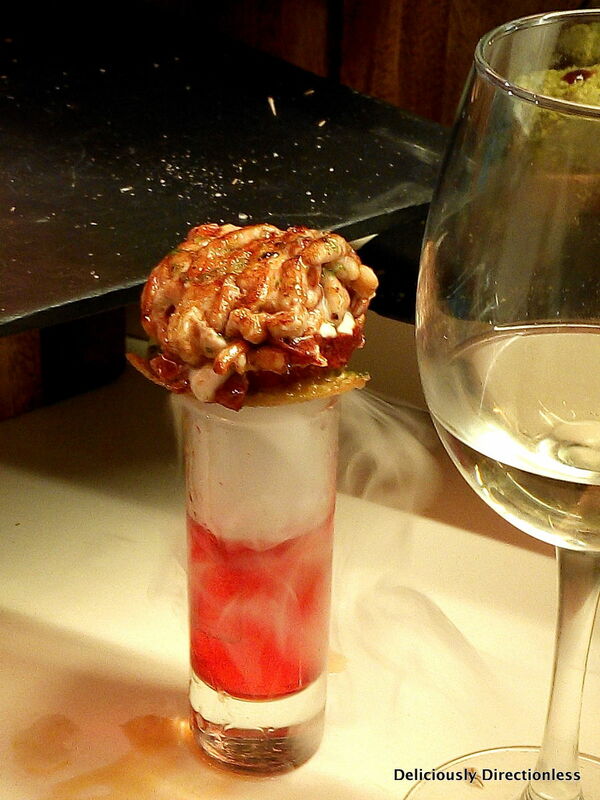 Bar Zeruko (Arrandegi Kalea, 10, San Sebastian) – for some avant-garde, experimental pintxos like rosa de bogavante (lobster served over a smoking shot of rosewater). 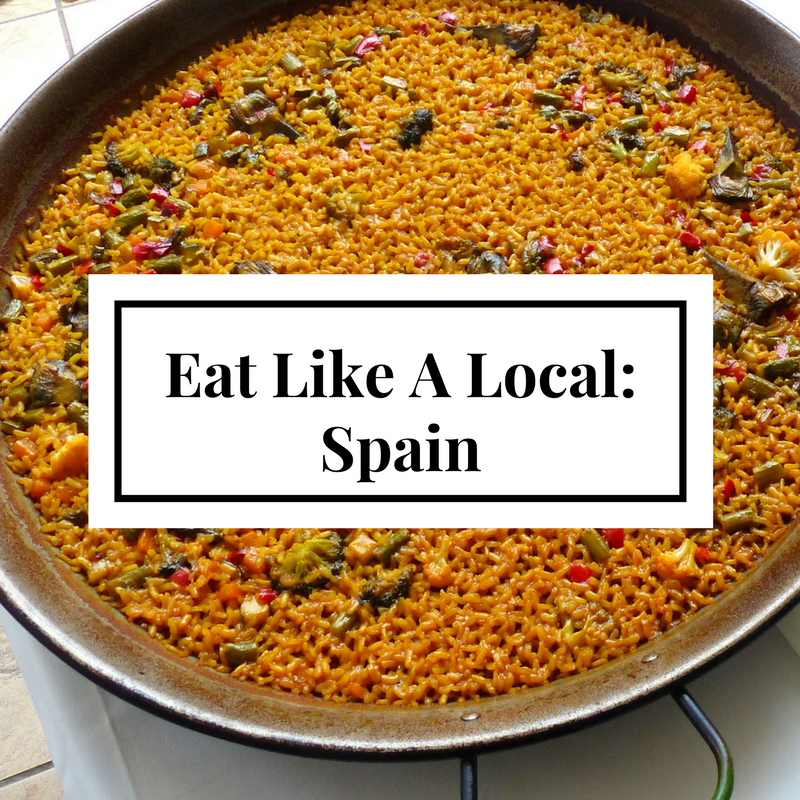 A food trail with Devour Spain is a great way of experiencing authentic Spanish food in Barcelona, Madrid, Seville and Malaga. Tasting trails start at €56 (approx. Rs. 4,850). Details at devourspain.com. This feature was commissioned by The Leela Magazine and was published in their Spring issue. Read it here. What a lovely food recipes site i ever come across in my entire life! And i just can’t wait to try them up asap.